Creative CelebrationS is located in Fort Walton Beach, in the Panhandle of Northwest Florida on the beautiful, sugar white beaches of the Emerald Coast. Belinda Motley, cake designer & decorator/sugar artist; has over 30 years of wedding & speciality cake designing, baking & decorating experience, with many awards to her credit. Her cakes have been seen on Food Network's National Wedding Cake Challenge & on Food Network/Sugar Rush. Additionally, her cakes have been featured in American Cake Decorating Magazine, Southern Bride, Emerald Coast Wedding & Events Magazine as well as, MailBox News Cake Decoration Magazine. 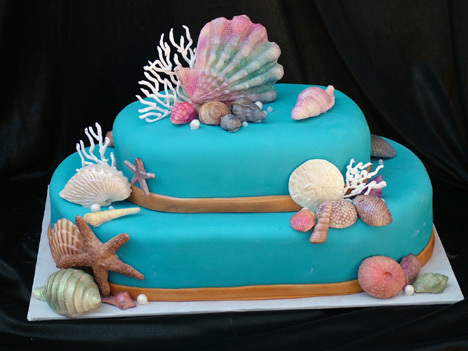 Belinda specializes in rolled fondant cakes with accents of hand-made, life-like sugar paste flowers & edible, handpainted, realistic white chocolate seashells. Also, available to enhance your beautiful traditional or trendy wedding cakes, are a variety of icing, fresh or silk flowers. Creative CelebrationS' tasty, moist, homemade cakes are available in a wide variety of flavors & fillings combinations, sure to please the most discriminating bride & her guests! 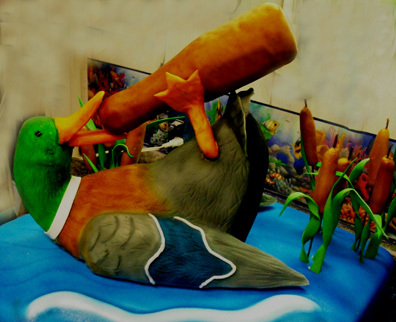 Custom, whimsical & 3-D sculptured cakes...in the shape of footballs, golf bags, ice chests filled with ice & beer, ducks, cars, boats & many other fun shapes....are very popular as groom's cake. If Ace of Cakes & Cake Boss can make it.....We can too!!!! Just Ask! For destination brides, we make designing & ordering your wedding/groom's cakes easy, with colorful cake photos via this web site...thru e-mail contacts or personal consultation in our shop. Consultations scheduled to fit a bride's busy schedule. 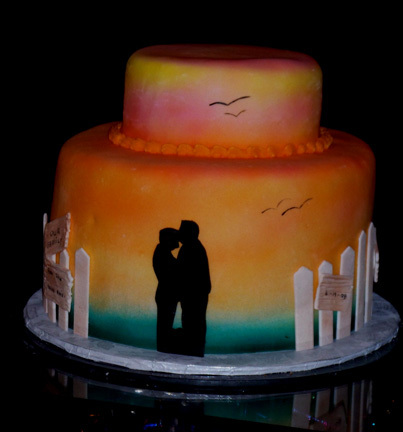 Your special wedding or groom's cake can be created from one of hundreds of photos we have available or from your own photos, drawings/ideas....creating an original, one of a kind, custom designed cake for your wedding celebration or other special occasion cake. Creative CelebrationS has been commissioned to design cakes for a number of area resorts & restaurants.....Barefoot Weddings, Inc., Tropical Beach Weddings, Emerald Grande, Kelly Plantation, Criolla's Restaurant in Grayton Beach, Seaside, Sandestin Hilton Golf & Beach Resort, Beach Walk Cafe' in Destin, Hidden Creek Golf & Country Club, Henderson Park Inn & Georgia National Fair in Perry, Georgia to name a few. From an intimate celebration for two to a grand reception for hundreds, no cake is too small or too large! We do deliver & set up to many area venues, as well as on the beach from Gulf Shores to Panama City Beach. If you would like to pick up the cake, we can have it boxed for travel. Call 850-315-0969 or use the link below to email us to set up consultation time to begin planning your wedding cake! THE GULF COAST BRIDAL FAIRE!!! We will have wedding & groom's cakes on display as well as yummy cake to taste! Our business card, stamped with offer is required at time of ordering. This offer not redeemable for cash.